For Delphi XE4 – 10.3 Rio (FireMonkey). Lifetime Updates Included! 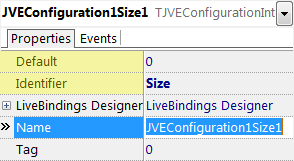 Every value you create belongs to the TJVEConfiguration component, but is also created directly in your code, allowing you type-safe, compile-time verified, access to all the values, as follows: JVEConfiguration1Size1.Value (for the value in the screenshot below). Identifier – the identifier to use to access the persistent storage for the variable. Upon a change of this property in the Object Inspector the Name and its source code reference will be reset. Default – the default for the value, before another value is stored in the persistent storage. The type of this property depends on the type of the value created. Value (runtime only property) – access to this property is actually redirected to the persistent storage; use it to read or write the persistent value. WriteBool(Ident,Value) – this and other Write functions preserve the value within the persistent storage with the given identifier. DeleteKey(Ident) – this function deletes a value from the persistent storage. Notice, I have seen this function fail sometimes on the Mac and iOS platforms, it is advisable not to use this function, instead writing the default value back into the storage. This class uses Windows Registry on MS Windows, JSharedPreferences on Android and NSUserDefaults functionality on other platforms. This purchase and product fulfillment are through FastSpring, a trusted reseller for JVESoft. Analytics only pack is now available for FREE! Tracking how your app performs so you can iterate fast and optimize it for your users is important. Analytics are key to any successful app. Getting good app ratings in the app stores are also important. Our Google Analytics API wrapper and App Ratings components can help you achieve success with your Delphi Firemonkey app. Now, FREE for non-profit and donation-supported use! Monetizing your apps is an important part of a consumer app on the various app stores. Our banner and interstitial components provide a variety of options to implement ads from Chartboost, RevMob, AppFlood, AdMob, iAd, and even your own custom ads. Our payment components help you integrate your Delphi Firemonkey app with Apple IAP, PayPal, and Android IAP. Connecting with your audience on social networks is more important than ever. Our social components help you should content to Facebook, Twitter, and SinaWeibo. You also want to keep your audience coming back to your Delphi Firemonkey app which is why our Push Notification components can help you retain the users you already have. Whether it is sending an email, opening a URL, embedding a web browser, optimizing your app layout, or storing settings in your app our helper components can streamline your app creation process. Supporting all of this functionality across Android, IOS, Windows, and Mac can be difficult but using our components makes it easy in Delphi Firemonkey.